A foggy Wednesday at BRC had camp convinced that we were thousands of miles up in the clouds! To celebrate the opening of Sky Camp, we started our day with egg and sausage sandwiches preceded by some hefty oatmeal. To top it all off, the CITs created a human ladder for fill-in Head Counselor Jake to ring the bell. Truly a sight to behold! Inspection was tight today, after the kids learned they had to do open trunks! The pressure created some impressive results, including a pristine Cabin 8 and a military-tight Owls Perch. Once the heat was off, the kids raced up to activities despite the intense heat! Badges flew out as Campbell H. earned his Junior Tennis in a single period, and Josh R. earned his Senior Art badge after recreating the Mona Lisa. Yeoman and Bowman badges went out to Charlie M., and maintenance parts went out to all the Moose who signed up for Mountain Biking (the new trail through Swamptown is slated to be included in the upcoming X-Games). While badges were flying at camp, several trips left campus today for top secret adventures! 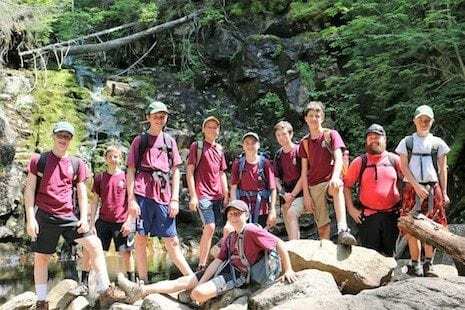 Ten campers went all the way to Portland to watch a Seadogs game and munch on hotdogs, while ten other campers went to the Gray Animal Park to see the indigenous species of Maine. To top it all off, our best golfers headed out to the Oxford Hills Driving Range and played the front nine, showing that Birch Rock men are well versed in the classiest game around! To battle the sweltering heat of the afternoon, the kitchen served some delicious cold cuts and fresh salad! The afternoon saw plenty of activity, although almost every group ended up down by the water to cool off. Another Upper Camp deep-end general saw an intense game of Water Polo break out, followed by a muggy second rest where the only breath of wind came from the fans in the cabin. To quote Nathan S., “Why does it feel like I’m standing on the sun?”. Fortunately, Danny in the kitchen knew exactly what would raise our spirits: a second Hungarian dinner night! The meal and atmosphere were excellent, as camp noshed on chicken paprikash and gnocchi, followed by dark chocolate layer cake. Evening activity was soon led by our honorary Hungarian, who taught camp several new phrases and played us one of the most popular songs in Hungary. To end the night, the boys rallied up to the field to play a new game called Sitter and Catcher (which is still in the beta testing phase). It was a rip-roaring good day, and the thunder clouds in the distance let us play all day! Fingers crossed for more good weather, send a prayer to McWain Hill Road. Stay tuned for more! Next PostAugust 2 - Here's to Hugh!